July dog of the Month; Stetson!! 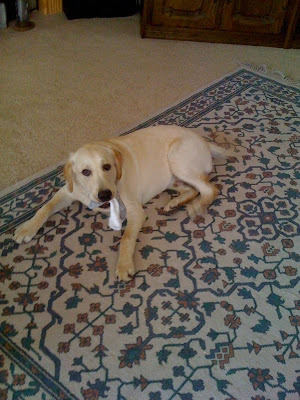 Naughty Stetson with a sock!! Baby Stetson....how could you not love that! Stetson as close to Tiger as possible. 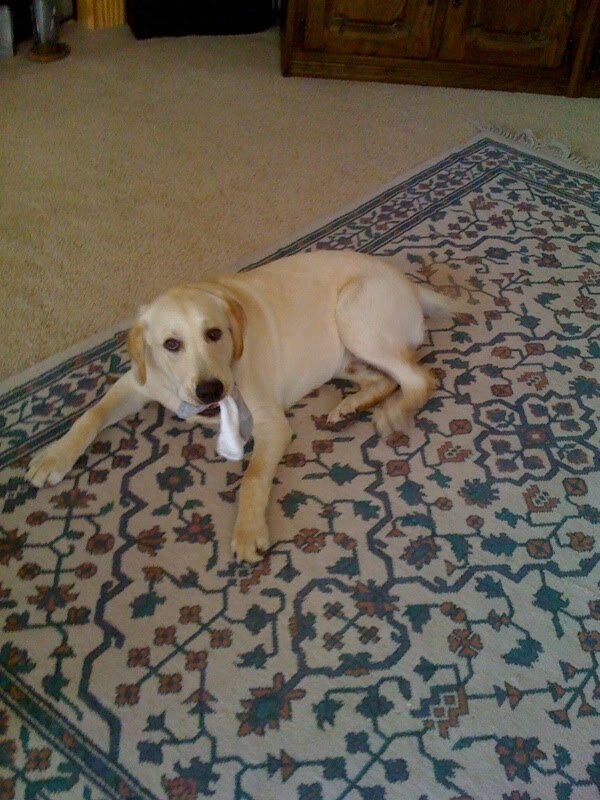 Stetson is a super loveable Yellow Lab. 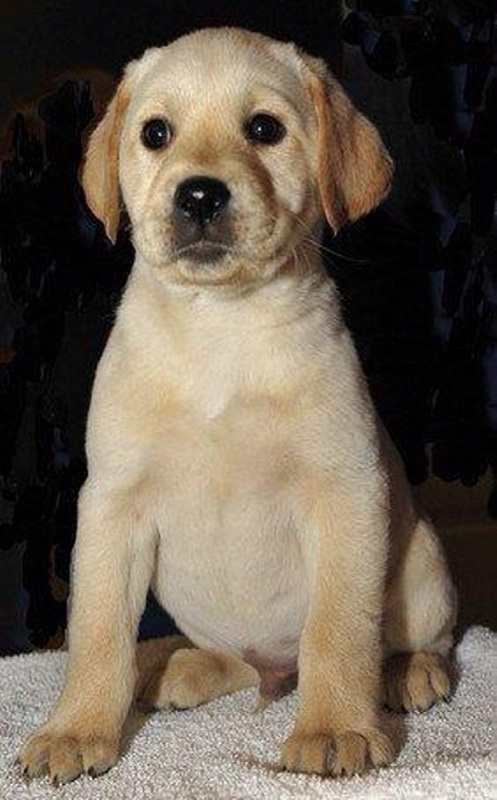 We still think of him here at Ruffledale as a puppy, but he actually turned a year old on February 13th 2010. He’s still a puppy at heart! Stetson LOVES to play with all of his friends. He is so silly and crazy when he is with other dogs. The only time Stetson likes to be away from his family is when he is at Ruffledale playing with his friends here or at the dog park. Other than that, he is always right with his pack at home. He doesn’t ever go far and makes sure he is always right ON their feet at home!! Stetson thinks of his family pack as his favorite “toys” and loves his Mom, Dad, human brother Alex and his friend Crystal. Stetson loves it when Alex is home from college because he will come get him mid-day from daycare and take him on hikes and then bring him back to play more. Then he gets to do all his favorite things in one day!! Stetson thinks “Tiger” the families 15 year old Orange American Tabby should be part of his pack too, but Tiger doesn’t agree. 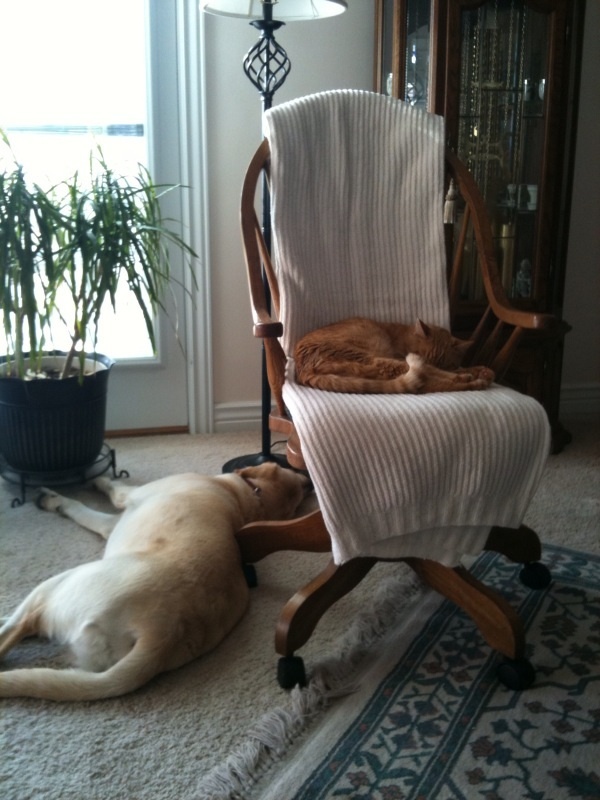 Stetson gets as close as Tiger will allow him and is sure to thoroughly explore every spot Tiger has laid in.....Maybe someday tiger will join the world of Stetson’s friends. Stetson has a bad little habit of eating things he is not supposed to. His favorite thing is socks, but he also likes to eat stuffed toys he has torn up, gloves, and balls out of a love-sac. Stetson likes to eat these things, but he also likes to go around and find them to show his Mom so she can chase after him for them! Stetson has already spent a night in the Emergecy Room because of his eating naughty things. He had to throw up his favorite toy he ate while he was there. Now he is not allowed to have stuffed toys anymore. Although he is sad about that, he likes his red Kong that his Mom and Dad will fill with treats too! Stetson LOVES to eat, almost as much as he loves to play. A true lab! When his family gets his food ready he does his best tricks... “Sit” and “Stay” so he can show them what a good boy he is! Stetson can also spin and shake. At Ruffledale he is always one of the first to eat, because he is so excited. Stetson came home to live with his family as a tiny puppy. His family was attached immediately. Stetson cried the whole car ride home. It didn’t take Stetson long to settle in to his new home though. Once he got home and found all of the new things to explore how could he be sad anymore? Plus his new family was so great and devoted to him! After he’d been in his new home, his family took him to puppy training class. That was great too. He loved getting through the class so he could do playtime at the end! Stetson started coming to Ruffledale when he was just shy of 6 months old. He was so crazy on his first visits, he couldn’t even slow down enough to really play! He just ran around so happy and excited! Now he is one of the funnest dogs here! He loves to play with everyone and loves to be right on our feet too! We all love our silly little Stetson!